Handling feedback and criticism is challenging for most of us and is a common issue on which I coach my clients. So when I came across a great article in the Chicago Tribune by Rex Huppke about a journalist and blogger named Ann Friedman who refers to herself as a “low-maintenance swagger lady” and a feminist, I was intrigued. In my work as a career and personal coach, I have found that one of the things most clients struggle with is handling feedback and criticism. Even those who are willing to hear the feedback often can’t discern if it’s genuine and if it is, what to do with it. Friedman’s Disapproval Matrix is a great tool to help solve both issues. Here’s how it works. There are four quadrants. The horizontal axis has a line with arrows pointing to one label on the left: “People who know you well;” and one label on the right “People who don’t know you.” The vertical axis points to “Rational” on the top and “Irrational” on the bottom of the diagram. We’ve all seen a lot of these models and may assume this one is just like every other 4 quadrant schematic out there. But it’s not. It’s much more powerful because it helps you vet your critics, regardless of your profession or walk in life. Quadrant 1: Upper left quarter of diagram labeled “Lovers.” It consists of those people who know you well AND are rational. These are people who want you to succeed and who give a darn about you. (Friedman uses an explicative here. )These are people such as your mom, your closest work colleagues, or your best friend. In other words, they are the folks for whom you have mutual respect. Their feedback is worthy of listening to and acting upon. Quadrant 2: Upper right quadrant, labeled “Critics.” This section of the diagram refers to people who know of you and are rational. These people are experts in your field – people for whom you have a great deal of respect. These are people who are criticizing your work not you personally. You absolutely want to listen to these folks. Their feedback is critical to your success. They are smart and know something about your area of expertise. 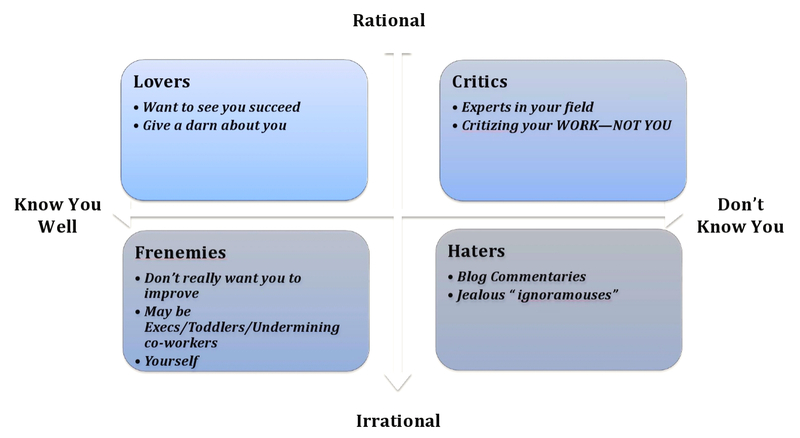 Quadrant 3, Lower right with the label “Haters.” These are the folks who don’t know you and are irrational. Why the heck would you give any credence to the feedback they are giving you? They often deliver their messages in a public forum like comments on your blog and with such venom and force, it make you want to reach through your computer and strangle them. Freidman calls them “ignoramouses.” (I love that term.) You are best to turn blind a eye to what they say. Walk away and don’t look back. The final quadrant is perhaps the trickiest and Friedman calls “Frenemies.” These are the people who know you well but are irrational. They’re not necessarily bad people. In fact, they could include your screaming toddler in the checkout line at Target, or an undermining co-worker who gives hurtful and irrelevant 360 degree feedback, but never had the courage to tell you to your face. It is even sometimes your boss who is too nice to tell you that you are failing. And sometimes the most damaging “frenemy” of all is that person you look at in the mirror every morning. Yep, that’s right: yourself. So the next time you get a little dose of feedback, think about where it sits on “The Disapproval Matrix.” You just might find it a whole lot easier to both swallow that feedback, take action or not. This entry was posted in Executive Coaching, Leadership, Organizational Development and tagged disapproval, executive coaching, feedback, handling criticism. Bookmark the permalink.